So, the first one I’m going to share with you is the dining room of a dear friend. Their family just built an AMAZING new home (it’s seriously one of the best ones I’ve seen in Denver! ), and they were looking for some fresh ideas to finish up their dining room. They had purchased a gorgeous dining set and rug, but that is all the further they had gotten. 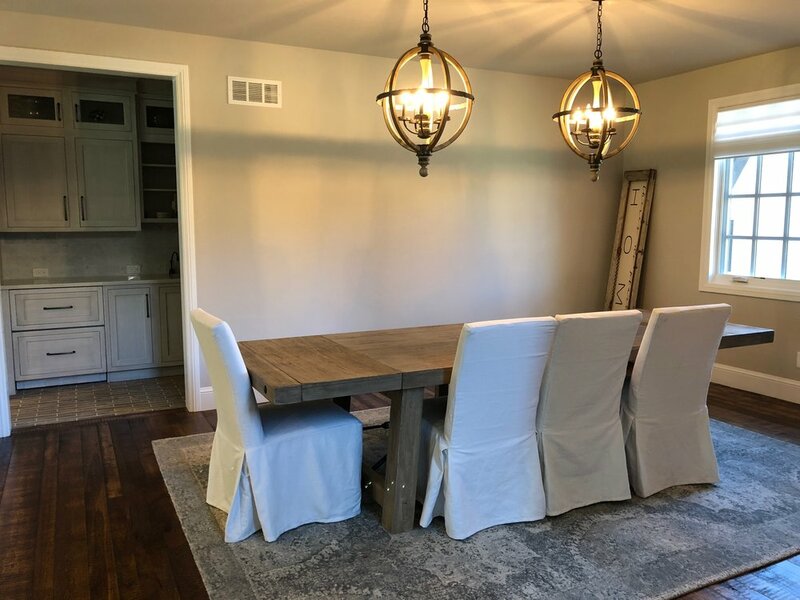 Here is what their dining room currently looks like. They have some beautiful architectural details in their home already (ceiling beams, shiplap, stone walls, brick floors - I’m telling you… it’s stunning), so I took some creative liberty and came up with an idea that I felt would be more unique than what most homes would have. Their home has so many natural elements to it, that I thought a wood beam stretching the length of their room could make for an oversized mantle effect that would give it a little more organic and minimalistic feel than a traditional sideboard and/or hutch… although that would be beautiful as well. Take a peek and see if you can envision this room with these suggestions. Stay tuned because I have another Six Fix ready to show you as well, and if time allows, I may be asking for some submissions to do more of these in the near future. Do you have a space that could use a Six Fix? ?